Direct Planning Industry is a planning software that has been specifically designed to model industrial schedules of small and medium-sized industries. Highly configurable, it fits your trade. Very user-friendly, it helps you scheduling while keeping to your constraints of routes and time limits. Direct Planning is a data-level configurable planning software. It lets you customize the data, whether entered or automatically imported from within your information system (ERP, CAPM). Thus you’ll retrieve your customers, orders, articles or any other technical information useful for planning. 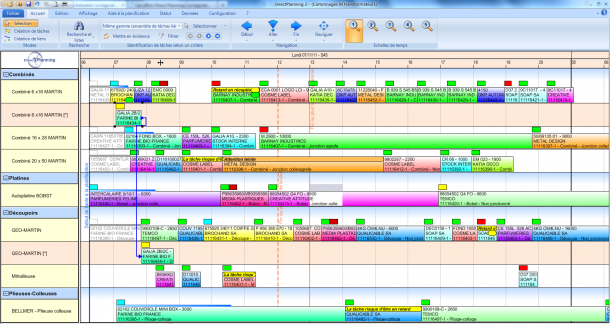 Direct Planning is a visual-level configurable planning software. You can create many views of the schedule. For each view, you configure the data to display and the colorization mode of each job of the schedule.